Have you ever needed to collect an additional piece of information, not collected by LANDESK by default, from one of your managed Macs? The answer to that question will very likely be yes simply because every business environment is unique. Often, the additional information that needs to be collected is simply a matter of enabling the LANDESK inventory scanner to pickup a new file type. 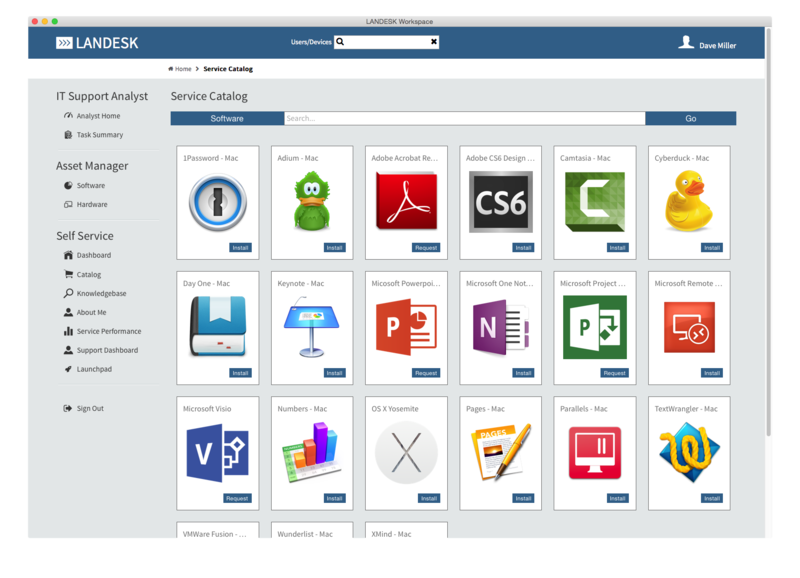 These types of changes are easy and can be added by leveraging the Manage Software List tool within the LANDESK console. For more information on this method, see the LANDESK 9.6 Help file link. However, if you want to collect the state of an object on the device, it may require a script to be written to query OS X itself. The response from the OS will then need to be captured in a format the LANDESK inventory scanner can then pick up and transmit back. The script below, written by Steve Goodrich for a LANDESK Interchange session, is an example script in which the OS is queried for the S.M.A.R.T. status after which the result is written to an output XML file. This article will walk through each step of the script to explain what is going on, however, it will not be covering the details of XML and BASH. I’ve posted some links below to research additional information on XML or BASH. Now we need to specify the output file variable that’ll be called throughout the script along with it’s associated file path. 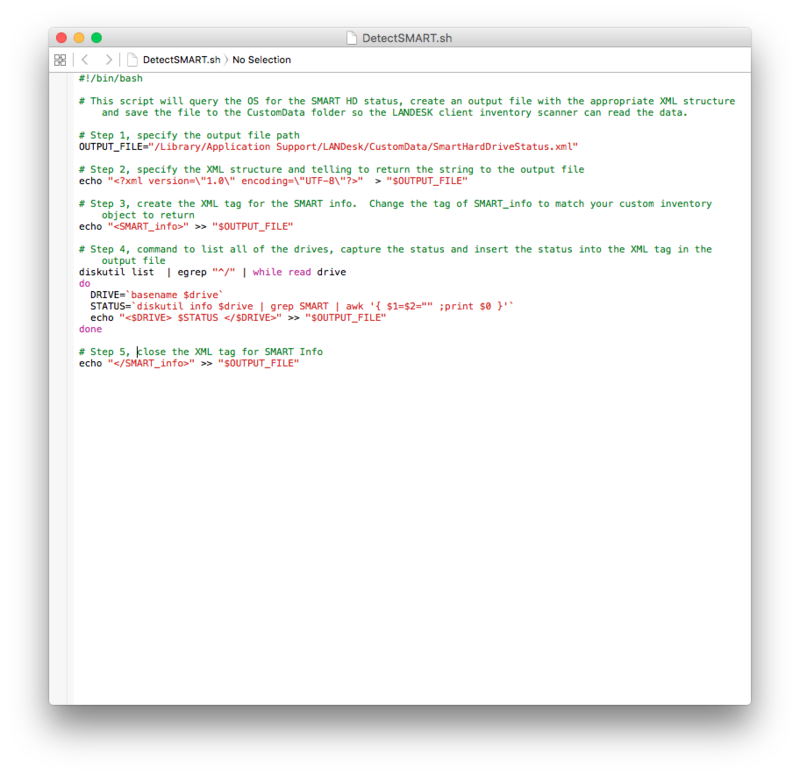 Because we want the LANDESK inventory scanner to pick up the information, we’ll write out output file to the CustomData folder and give it a name of SmartHardDriveStatus.xml. You can name your file whatever makes sense for the information you’re collecting. Next we’ll specify inside the output file, the XML structure we’ll be creating. The echo command will place the text after the quotes into our XML file. The carrot “>” before the “$OUTPUT_FILE” is telling the echo command where to write and the “$OUTPUT_FILE” is referring the variable created previously. echo "<?xml version=\"1.0\" encoding=\"UTF-8\"?>" > "$OUTPUT_FILE"
With the output file created and the XML structure specified, we need to create the opening XML tag in which we’ll save the SMART status inside of. OK, now we’re to the fun part. We need to query OS X and obtain the status of the hard drive. This can be accomplished using the diskutil command. Most likely, the custom information you want to obtain will require a different command to query the OS. Use the internet to search for the command you need and replace it with what is below. Just make sure you echo your result and write it to an XML tag. The example below has the results from the variables DRIVE and STATUS being written to an XML tag named from the DRIVE variable with the STATUS being written as the information inside the XML tag. echo "<$DRIVE> $STATUS " >> "$OUTPUT_FILE"
The final step to the script requires us to close out the first SMART_info tag we created. It’s a pretty simple command. echo "<$DRIVE> $STATUS </$DRIVE>" >> "$OUTPUT_FILE"
Once the executable properties have been given to the file, you can manually run it on your test machine by calling it in terminal. 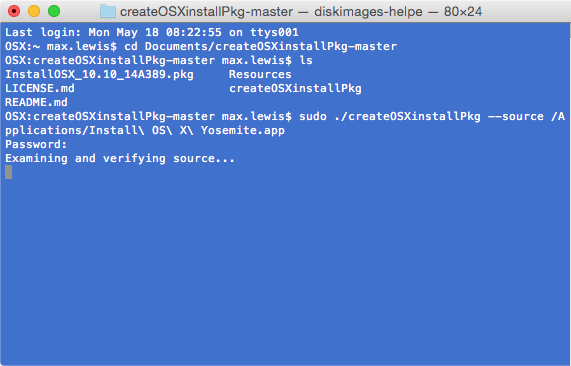 In my next post I’ll walk through how we can use the pkgbuild command to create a package out of our script, deploying it the Apple-esque way as opposed to the UNIX method of deploying a .sh file. VPP Without an Apple ID? Yippee! Apple’s WWDC is always full of surprises – especially surprises buried in the release notes of a product and not paraded on stage during Tim Cook’s, Forbe’s 25th most powerful person, opening Keynote. According to the release notes for the beta version of Server; education institutions, healthcare organizations, and retail outlets should be jumping for joy. This truly is the application deployment nirvana; VPP without an Apple ID! Without question, the primary complaint I receive from Apple device administrators, particularly those in education, is around the app distribution workflow Apple has previously allowed. While nearly every device management vendor can push an application to a device, including LANDESK, the restrictions from Apple required an end user to consent to installing the application; essentially tying it to an individual Apple ID. While large inroads have been made by Apple in recent iOS and OS X releases, such as allowing the business to reclaim the license from an Apple ID if purchased through the volume purchase program, which saved businesses a lot of money in lost software, it still required the app to be tied to an Apple ID. In controlled environments where the devices are utilitarian in nature (think schools, retail, or health care), in which the devices are setup for a specific function with no specific device owner, attempting to push an application was inefficient and very difficult to manage. Think about it, what end user is sitting on the kiosk iPad eagerly waiting for their shiny new application to be pushed from IT? Not. One. User. Apple, thank you for unshackling the app from the Apple ID – the Enterprise, Education, Healthcare and Retail worlds have just received a productivity “merit” increase. Where’s the Moat Around my OS X Castle? We all want to feel secure and protected, right? Kings, queens and other powerful individuals from ages past, built moats to protect their investments and the people they cared for. Today, while we may not all be kings or queens, we still have the desire to protect ourselves and our personal property. If you’re a Mac user with the belief that your OS X moat is impenetrable, protecting you from all foreign potential conquerors, it’s time to perk up and use a bit of caution. According to Pedro Vilaca, a well-known security expert for OS X, the moat around your personal world housed on your Mac has a major flaw. In Pedro’s blog titled, The Empire Strikes Back Apple – how your Mac firmware security is completely broken, he discusses that by simply putting your machine to sleep, an attacker can compromise the device; gaining root access to the firmware. So where did your moat around our OS X castle go? In the age of global connectivity, creating a moat sufficient to protect our personal worlds is proving to be increasingly difficult. Just ask the US government who publicly announced they’ve potentially suffered the biggest data breach in government history – a breach that could affect up to 4 million government employees. Unfortunately, our desire for uber-convenience enabled by near ubiquitous access to the Internet, with all of the benefits constant connectivity grants us, is also causing us to find there are more people trying to tear down our moats than people capable of building and maintaining them. After all, we’re the figurative kings and queens, we don’t build the moats; we just take advantage of them. Well, the bad news is that unless you’re on a mid-2014 or later Mac model, the exploit is accessible without direct, physical access to the machine itself. Essentially, anybody with the proper wherewithal can compromise the firmware on your machine and take it over simply by targeting you before you put the machine to sleep. Then, when it wakes up, your moat will have suddenly vanished, giving the attacker full-root access to the firmware and subsequently all of the data on your device. With firmware level access, more calculated attacks are feasible and they could happen without you even knowing about it. Jose Pagilery, writing for CNN money, says that because the vulnerability gives attackers time, they can plot an attack on a much larger scale, similar to the Sony Pictures hack from late last year. This is really bad. If your machine were infected, even if you buy a new hard drive, or format your existing drive, and reinstall OS X, it wouldn’t take care of the issue. The compromise happens at such a low level on the machine that you won’t be able to get rid of it until Apple releases a new firmware that builds the moat anew. The good news, well, there isn’t a lot to write about just yet. As a personal user, exercise caution and prudence in the sites you visit on the web. Apple has not publicly commented on the vulnerability yet and there are no known fixes. If you’re not famous or a public figure, the odds are ever in your favor that you will not be randomly targeted. As a corporation, however, there is cause for concern as your employees may be a deliberate target. If you are in charge of corporate machines, for now, make note of the Boot ROM version on all of your Macs. In LANDESK, this can be done by creating a query and storing it for later use. When Apple releases a firmware update, you’ll already have a list of all vulnerable machines and will quickly be able to take action to repair. To create this query, right click on the My Queries or Public Queries from the Network View and select New Query. Give your query a name, something like Mac Boot Rom Version would suffice. From the Machines Components pick list in the upper left-hand quadrant, scroll down and find the attribute Type, it’s the second to last object under Computer. Select Type, then select the = sign from the operators column and select MAC from the right hand column for scanned values. In the Machine Components colulmn in the bottom left-hand quadrant, expand BIOS and add Boot ROM Version to the column set of data to display. Once you have the query, get on the phone and call Apple asking them when a security fix will be coming. They’ve fixed the exploit on their newer hardware, either knowingly or unknowingly, regardless of which it is, they have the receipt to fix the moat…at least this time and your castle needs it.